Ronald Barasa Wakwabubi is a 47-year-old teacher living on the rural outskirts of Eldoret, a city in western Kenya. Despite being close to the city, he, his wife, and five children have had to light their home with expensive, and often dangerous, kerosene lamps, because the electricity grid does not reach their home. Smoke and fumes from the lamps have been causing the family numerous health issues, and the children complain of chest pains and itchy eyes. They have also struggled with their homework because, even with the lamps, visibility is poor when the sun sets. When mum and dad wanted to charge their mobile phones – which are a necessity where no landlines exist – they would have to travel to a local shop. However, things have changed for the Wakwabubi family. Life is very different since they had their first home solar system installed. Sollatek is one of the pioneering firms working to bring power to hundreds of millions in sub-Saharan Africa, and, earlier this year, Wakwabubi and his family became one of its burgeoning number of customers. Since buying the Sollatek solar home system, the family has been able to save some of the money they used to buy kerosene. They also charge phones for their neighbours, which brings some extra cash into the household. These savings have enabled the family to pay for further tuition for the children, as well as paying monthly for the Sollatek system. About one billion people across the globe do not have access to electricity. According to Power for All, a global coalition of 200 private and public organisations campaigning to deliver universal energy access before 2030, two-thirds of these people reside in sub-Saharan Africa. Saleem Abdulla is the managing director of Sollatek Electronics, a Kenyan firm that began providing voltage-protection equipment in Africa in the mid-80s, before expanding into the solar market in the mid-90s. The group now sells its solar products into small businesses and homes in seven nations across eastern Africa, and works with local partners to provide credit for people like Wakwabubi, who is paying for his family’s system over 24 months. One of the main issues preventing solar technology from getting in more homes in this vast region has been the financing of the systems themselves. But, like many other solar companies operating in the region, Sollatek has found a solution. A UK investment initiative called Energise Africa helps connect investors, big and small, with those companies installing these life-changing solar systems in the region. Helping out families like Wakwabubi’s doesn’t just give investors a warm fuzzy feeling inside; the potential returns aren’t bad either, coming in at between 4% and 7% a year. Energise Africa is backed by online impact investment platforms Ethex and Lendahand, which between them have attracted more than 14,000 investors and raised a combined £80m for social enterprises, charities and businesses since 2013. Sollatek is about to return to the platform in its latest fundraising; it is seeking £135,000, which will ensure it can add to the 4 million people it has brought power to in the past seven years. 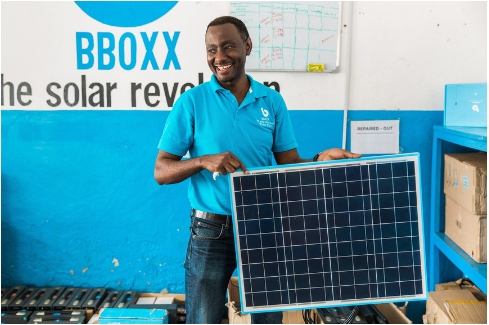 Another group to have benefited from the Energise Africa investment platform is London-based BBOXX, which designs, manufactures, distributes and finances “plug and play” solar systems to improve access to energy across Africa and the developing world. Mansoor Hamayun, the chief executive and co-founder of BBOXX, says mobile payments have helped boost sales of solar solutions in the sub-Saharan region, and ensured finance terms for the equipment are easy to manage for both the customer and the supplier. “Paying via the mobile phone has really taken off in Africa,” says Hamayun. “What’s more, a simple solar kit is actually cheaper than the alternatives. To date BBOXX, which launched in 2010, has installed 160,000 kits and Hamayun believes investing in expanding installations still further has a mass-market appeal, as well as helping to solve a humanitarian crisis. Caroline Frontigny, co-founder of upOwa, shares Hamayun’s view. Her group distributes solar kits in off-grid areas in Cameroon and has just launched its latest fundraising round through Energise Africa. According to Tobias Grinwis, an investment officer with Lendahand, Energise Africa is seeking to raise between £25m and £30m over the next two years, which will bring power to more than 100,000 homes. However, Grinwis’s end goal is far more ambitious. Information about the risks of investing: This investment opportunity is not endorsed or administered by the Guardian; it is not a risk-free investment, and the returns are not guaranteed. In the worst-case scenario, if there was some kind of disaster/crisis/bankruptcy, you could lose some or all your capital, and you would not be able to get redress from the UK’s Financial Services Compensation Scheme or complain to the Financial Ombudsman Service, so you need to go into this with your eyes open. It is a direct loan to a company and not a savings or investment product offered by a financial institution – therefore, it is recommended that you are careful with the amount you invest. If in doubt, seek advice from a qualified independent financial adviser.